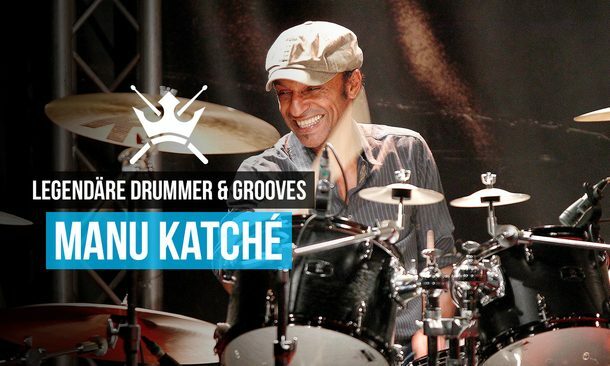 Welcome to “Legendary Drummers – Legendary Grooves, edition #7! Today’s protagonist is a truly legendary player, but also a highly controversial personality: Mr. Bernard “Pretty” Purdie. There is no doubt, that his drumming has left a strong mark in the history of popular music, especially in Soul and Funk, but the creator of the “Purdie Shuffle” has also drawn a lot of negative attention over the years by his egocentric behaviour, exaggerated story telling and most of all by his clearly unproven claims about having recorded for the Beatles. 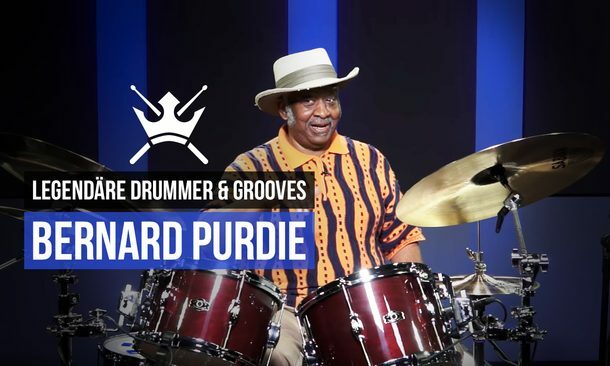 Nevertheless, Purdie is correctly considered one of the greats of all time, and his many influential recordings speak a clear musical language. In this bonedo exclusive workshop we are taking a close look at his drumming on Aretha Franklins iconic Track “Rock Steady” (1971), which features an irresistible Funk-Groove, that couldn’t be more typical for “Pretty’s” infectious playing, consisting of rolling ghosted snare drum notes and subtle hihat-openings, as well as a break beat section with a groove that turned out to be one of the most sampled grooves of all times. As usual with this workshop series, you will find transcriptions, detailed groove-analyzes and re-recordings of the beats by your’s truly ! Have fun studying and playing the Funk of the legendary Mr. Bernard Purdie! I like to practise my drums. Always have. It feels great, to tackle a technical or cognitive skill that couldn’t be achieved at the time, but after some focused and disciplined work on the instrument, is really owned. To make practising not only fun, but also noticeably effective, I prefer using and coming up with conceptional workouts and excercises, that can offer a wider range of improvement in the long run, as opposed to simply appoach the obvious deficit. In this new video workshop series, exclusively for bonedo drums, I would like to present you some of my personal conceptional approaches, that have helped not only me with my own development on the drums, but have proven to be extremly useful to legions of ambitious students that I have had the privilige to teach over the years in various institutions and situations. We all are aware of the importance of control, interdependence and balance on the kit; and the ability to percieve rhythmical structures from different perspectives. Though, from time to time we find ourselves confronted with the weak spots in our playing – and if so, it can make us feel frustrated. Even if our fellow musos don’t twig the stress we are going through with a certain groove, fill or other musical challenge, we know for ourselves – because we have learned to hide the deficit and fight ourselves through the moment. The here presented workout, which I call “Moving Paradiddles – Moving Feet”, is just one of many ways to train and improve the mentioned skills on the drums. The written workshop with the musical notation on bonedo is in german language only, but here you can find the english video version. As with all practice, you can look at this concept as just some dull excercise – or you can understand it as a musical routine, a little piece of music, that you create while practising and which you can play with touch, sound, creative orchestration and instrumental joy. It’s up to you. I recommend to place your focus on precision over speed, and constantly monitor yourself. Continuously check, how souvereign and comfortable you feel in terms of body balance, control and perception of where you are in the bar. And count out loud. Play the excercise at a very low volume as well as with fierce energy, just like you would play any music. And practise with a click – and definitly without! The question is: Can you play it – and can you play it relaxed? After you mastered it, go ahead and modify the excersise, change it up and make it your own. There are no limits to your creativity. I hope you will enjoy this workout. 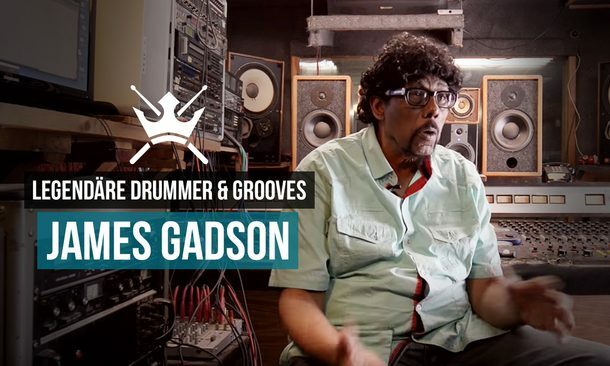 This time I want to introduce you to one of the most recorded drummers in R&B, Soul and Motown: Legendary Drummers – Legendary Grooves # 6, presenting James Gadson. Having been successfully active for far more than half a decade as a session drummer, producer, composer and even singer, Gadson is truly one of a kind. Now, being in his autumn years, he is still a sought after musician, also hired by comparably younger artists such as Justin Timberlake, Beck, Feist and D’Angelo, to give their music the special „Gadson-Feel“. His groove and feel are once more simply impeccable, and so „Running Away“ is not only a timeless piece of new, classic soul music, but also a great stage for displaying Gadson’s huge talent to shape the feel of a tune with his magic touch. 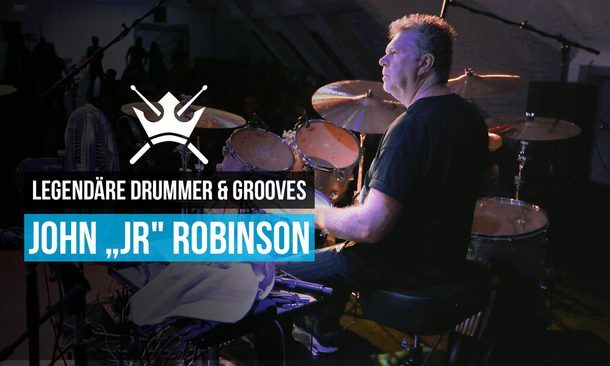 Check out the workshop with a detailed groove analysis and some re-recordings of his contribution to this future classic, exclusivly at bonedo drums – and simply enjoy learning from a groove-giant. In the fifth edition of my workshop series “legendary drummers – legendary grooves” we are talking about the master of masters, the one and only Vinnie Colaiuta and his “turning Ride-Cymbal-Bell” within the infamous 7/8 groove from the song “Saint Augustine In Hell” by his long time employer, Superstar Sting. There are countless musical reasons for the legendary status Vinnie has earned for himself in the drumming community over the decades, his breathtaking, virtuos and yet stunningly tasteful playing has inspired and impressed legions of drummers worldwide. The workshop is dedicated to the groove for the song “Saint Augustine In Hell”, found on the 1993 Grammy Award winning Album “Ten Summoner’s Tales”. The fairly simple 7/8 groove is a perfect example for Vinnie’s ability to contribute exactly what a song needs, yet adding an innovative touch including style and finesse. As far as I recall, there has not been a comparable groove before this, utilizing the “moving ride cup in quarter notes” ; an idea which generates the illusion of a straight pop song-feel, playfully avoiding the usual clunkyness of an an odd meter beat. This bonedo drums -exclusive workshop, featuring another timeless masterpiece, comes, as usual, with transcriptions, groove analysis as well as authentic re-recordings by your’s truly. Take the opportunity and learn from the drumming genius of a unique drumming hero, and let yourself be inspired for coming up with your own odd meter creations. 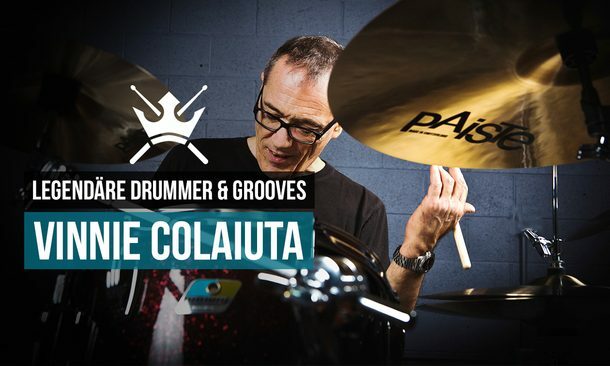 Wishing you great fun with the work of a true legend – Vinnie Colaiuta! This bonedo drums workshop-series is called “Legendary Drummers and Grooves”. So it is pretty obvious, that a drummer, who is commonly known as “The Legendary Nate Smith” needs to be featured here at some point. 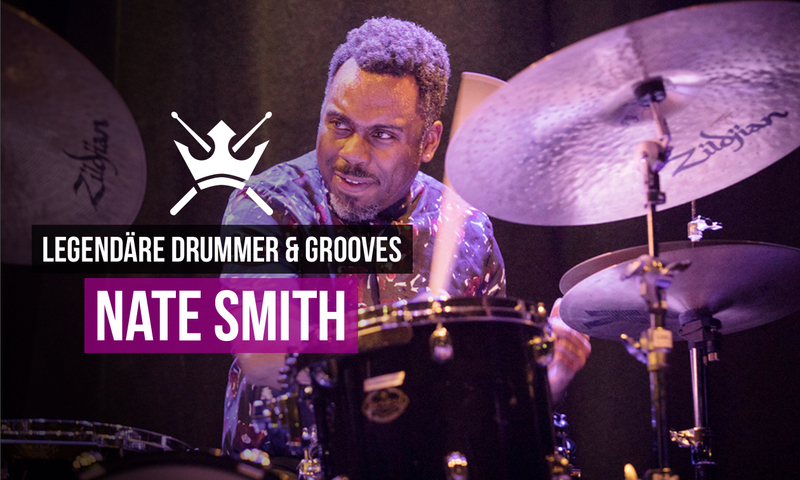 This is part 4 of the series, and Nate has been all over social media in the past years; his infectous and explosive mix of Funk-Jazz-Rock-Loop-Style-Drumming has earned him his well deserved “legendary” nickname and status amongst fans and colleagues. Now Nate has caused another big stir by his involvement with members of the beloved “Vulfpeck”: Bassist Joe Dart, guitarists Corey Wong and Mark Lettieri (Snarky Puppy) together with Nate formed a Vulf-Records-project named “Fearless Flyers”, and what they play is some serious Funk! In their hard grooving track “Barbara” – featuring Ghospel-Icon Sandra Crouch on tambourine – Smith lays down an irresistable high-energy-groove-improvisation, which I here would like to bring to your attention in greater detail. In this further bonedo-exclusive workshop we will take a look at transcriptions of he impressive Drum-Intro and the track’s main groove as well as some re-recordings, all done with great admiration by your’s truly. 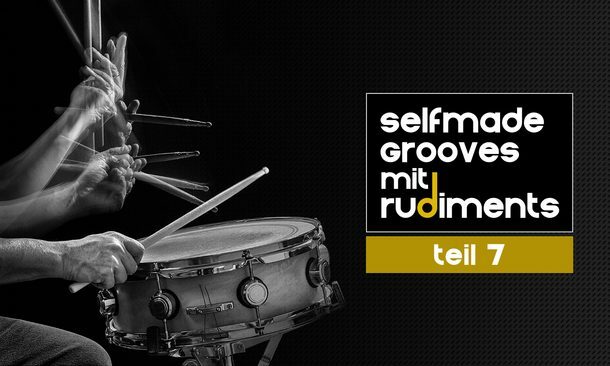 I personally found it extremly inspiring to take a close look at this special drummer’s very individual and unique approach to our instrument – i hope you feel the same! Have a look, have a listen, enjoy! Sometimes you hear a piece of music – and feel instantly intrigued. Intuitivly you know, that you just stumbled over something magic. When I heard Steve Winwood’s “Higher Love” featuring John “JR” Robinson on drums for the first time as a fifteen year old, it was exactly like that for me. The percussive, dense and atmospherical feel, created in a mix of lively tracked drums and programmed percussion simply blew me away – and confused me. What’s the ingredients? What’s the patterns? And: Where the funk is the “one”? Today, many moons later, I take the opportunity to write yet another groove workshop for bonedo drums exclusively, this time shedding some light on the mystery of this grammy award winning groove masterpiece, created by one of the greatest players in the history of the modern drum kit. You can find the original recording, a video with John explaining the process in the studio plus my re-recordings and transcriptions of the “Higher Love” -Intro right here at the bonedo workshop (sorry, german language only). All you can do in one day – if you are Vinnie! We all know, Vinnie Colaiuta is a scary monster on the drums. There is no doubt that he is amongst the very greatest of all time – and this recent session-video gives an insightful impression of his true mastership. Vinnie is tracking for Brian Eisenberg Jazz Orchestra , playing elegantly relaxed, tasteful, musical and overall impressive beyond belief.. He recorded the whole album within one day – and at 2:24 introduced this hilarious (but also helpful) brushes-to-sticks-move. His black shirt helps to “support the illusion” in forefield. Damn. Here is the full Vinnie-in-the-studio-video from Brian Eisenberg. On November 2nd Ableton Live 10 was announced and will be available to the public from early 2018. The full update features countless new improvements, a sharp new 60 frame look, some brandnew devices and even a spectacular wavetable synth – plus it has tons of workflow improvements, such as the longly begged for ability to group-in-groups. But there is one new feature, that i immediatly fell in love with, as soon as i first got an early beta version of Live 10 a couple of months ago: „Capture“. We all have encountered the phenomenon of mentally choking, as soon as the „red light“ turns on. While playing around with ideas, you might find something you like (a beat, a bassline or chord progression) and then want to record it – but as soon as you try to make the recording, you cannot reproduce the exact, original idea. This is where Capture comes into place. In Version 10, Live is constantly monitoring, i.e. memorising all Midi notes played into the programm with a computer keyboard, Ableton Push or whatever inputting controller you use. It’s actually really simple: just play music and don’t worry about preparation and the eventual pressure of recording. If you start a new set, song or project in Ableton Live 10, you now don’t have to priorly decide on a tempo, turn on the metronome and then start recording. No, all you do is play. The necessety to define a tempo up front was something i always didn’t like; especially since Ableton brought us Push, it seemed kind of counterproductive to the actual concept of the controller being an integrated musical instrument. Now you can just jam beats or other ideas and whenever you are am happy with what you played, simply click the „Capture“ Button next to Live’s Transport or press [Record] + [New] on Push. Live will create a new, looped and timed-up clip, which contains the Midi-Notes, that you have played since you selected that track and record-armed it, respectively turned it’s monitor to „in“. A few rules with Capture. – To make Capture define the global set tempo by a captured clip, simply play the notes – while Live’s transport is not running. Capture will define the tempo of the set as it interpretates the input. – When adding another captured clip to the track or set, Capture will then interpretate this clip and again adjust the global tempo, if Live’s transport is not running. – Opposed to Live’s transport running: Here, Capture will not set a new global tempo to the set, but stay where the tempo was set last. – Capure will deliver the best results, if you play one more note landing on „one“ after your x-bar-long idea. – Capture’s range of tempo-analyzing lays between 80 and 160 bpm. If you are looking for a faster or slower tempo, you will need to adjust it afterwords. – If your first clip has a length of f.e. four bars, Live 10 will assume, that the next clip on another track that you are jamming in, will also be four bars long. If that second clip differs in lenghts, you will have to adjust it to your needs. – Yes, Capture also allows overdubbing: if none of the clips in a track are playing, a new capture will create a new clip in that track containing that last jam-idea. If a clip in that track is playing while you are jamming, it will add those new notes to the playing clip. – If you have f.e. jammed on track 1, but did not make use of the memorised notes by pressing either Live’s Capture Button or [Record] + [New] on Push, and then jam on track 2 and do capture that idea, the previous idea on track 1 will be deleted from Capture’s memory. This means, Capture will only remember what you played on a track as long as you do capture it before you capture another idea on another track. Those „rules“ feel logical and one gets used to the mechanics of Capture quickly. In my workflow the use of Capture is implemented already and i hardly ever go „old school“ and press „record“ to lay down a spontanious idea. 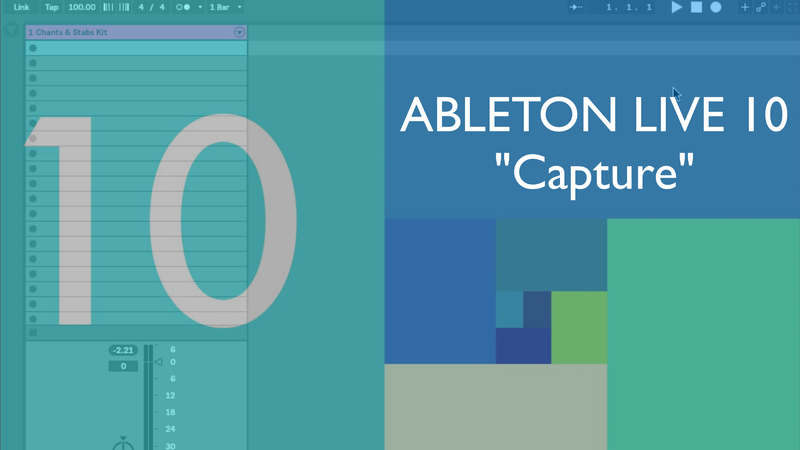 Capture is a groundbreaking new feature in Ableton Live 10, which significantly supports the Idea of spontanious music-creation and helps to eliminate the known phenomenon of „red-light-anxiety“. * Capture will be available for all Ableton Live 10 users, from Live Intro to Live Standard and to Live Suite. * Note: Ableton Live 10 is still in beta at the time of this blogpost, features may differ in detail at final release. 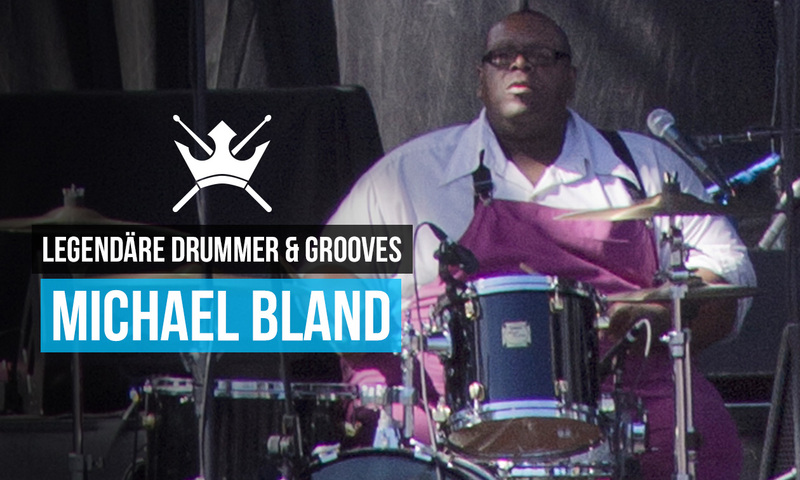 Groove Workshop: Michael Bland in the studio with Vulfpeck. During the last weeks a youtube clip of american funk combo Vulfpeck drew a lot of attention from the drumming community. Firstly, because the Michigan based band once more demonstrates their exceptional feel, tightness and funkyness, what, in my eyes, makes them one of the most interestings acts of these days; but also because of their guest drummer`s extraordinary performance: Michael Bland, mostly known for his long year engagement with Prince & The New Power Generation, nails the supposedly simple and “unclicked” groove for their new track “Hero Town” in such a relaxed and yet impressive way, that it brings a smile to every dedicated groove connoisseur. “Deep pocket drumming” at it`s finest – including Michael`s rather unusual stick-holding-technique. I wrote an exclusive workshop for bonedo drums with examples of some of Bland`s typical grooves and fills as well as a transcription and re-recording of the eight bar drum-solo. Check it out on bonedo drums!